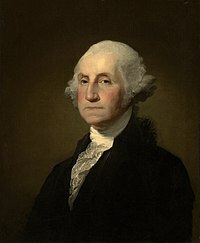 George Washington (February 22, 1732 – December 14, 1799) was the 1st President of the United States. "I cannot tell a lie, I did it with my little hatchet." Simple: I am not able to tell a lie, I did it with my hatchet. What it means: He was confessing to his father, Augustine Washington, that he had cut down a cherished cherry tree. Simple: People are not able run governments without God and the Bible. What it means: Religion is needed for a government to make good and moral decisions. "It may be laid down as a primary position, and the basis of our system, that every Citizen who enjoys the protection of a Free Government, owes not only a proportion of his property, but even of his personal services to the defense of it." Simple: We can say that this is one of the most important things. It is what holds up our system. Every Citizen who is protected by a Free Government should not only pay part of his property to help keep the Free Government safe. He himself should do work to keep it safe. This page was last edited on 27 October 2009, at 08:54.